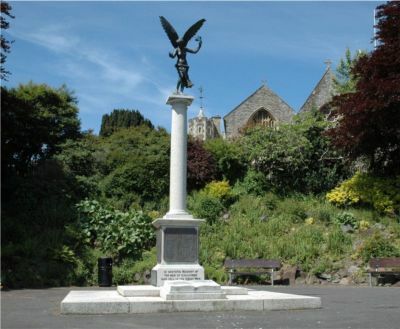 Adjacent to the church and the main road is a small garden created around the town's War Memorial. 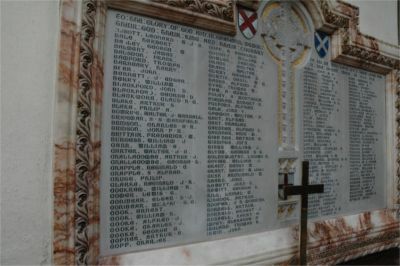 Within Holy Trinity Church is this fine memorial with 157 1914 - 1918 names arranged in four columns. On this page can be found details of those named in the first column. Click on CONTINUE to find the names listed in the three subsequent columns. 9188 Corporal Leonard William John Brooks Abbott of the 26th Field Company, the Royal Engineers. Husband of Elsie Abbott (née Coats) of Prospect House, Champernowne Crescent, Ilfracombe. Born in Bromley, Kent, in 1881. Died 1 November 1914 aged 31. 30276 Private Herbert Bale of the 1st Battalion, the Devonshire Regiment. Son of Richard and Jane Bale of Damage Barton, Mortehoe. Born in IIfracombe in 1893. Died 4 October 1917 aged 25. 20285 Private James Balment of the 2nd Battalion, the Essex regiment. Son of George and Mary Balment of 88 Salisbury Road, Slade, Ilfracombe. Born in Ilfracombe in 1892. Died 8 April 1918 aged 26. 46020 Private Francis John Balsdon ("Frank") of the 11th Battalion, the Welsh Regiment. Son of John and Jane Balsdon of Ilfracombe; husband of Margaret Balsdon (née Phillips) of Abergavenny. Born in Ilfracombe in the March Quarter of 1880. Died 27 September 1918 aged 38. 14482 Private Thomas ("Tom") Bamford of the 10th Battalion, the Devonshire Regiment. Son of Charles and Louise Bamford of 7 Foxbere, Hele, Ilfracombe. Born in Ilfracombe in the December Quarter of 1896. Died 14 February 1917 aged 20. J/18428 Able Seaman Harry Barbeary of the Royal Navy, HMS Hampshire. Son of Nicol and Rosa Barbeary of Ilfracombe. Born in Ilfracombe 26 May 1895. Died 5 June 1916 aged 21. SS/19589 Private John Beer of the 2nd Labour Corps, the Army Service Corps. Son of George and Elizabeth Beer; husband of Elizabeth Jane Beer of 9 Westbourne Grove, Ilfracombe. Born in Berrynarbor in the December Quarter of 1875. Died 28 February 1918 aged 41. Buried in Holy Trinity Churchyard. Captain John Edgar Bennett of the 1st and 2nd Battalions, the Royal Irish Regiment. Son of the late Lt.-Col. John Bennett (of the Indian Military Service) and his wife Sophia Julia Bennett of Score House, Ilfracombe. Born in Portsea in the March Quarter of 1891. Died 3 September 1916 aged 26. Believed to be 29012 Private William Berry of the 4th Battalion, the Grenadier Guards. Son of John and Betsy Berry (née Lerwill) of 6a Clarence Cottage, Belvedere, Ilfracombe. Born in Combe Martin in 1892. Died 12 May 1918 aged 26. 28843 Private John Davis Blackford of the 7th Battalion, the Duke of Cornwall's Light Infantry but formerly 2342 Private Blackford of the Royal North Devon Hussars. Son of Ann and John Blackford; brother of George (see below). Born in Ilfracombe in the March Quarter of 1888. Died 13 October 1918 aged 30. Buried in Holy Trinity Churchyard. PLY/2411 Private George Davis Blackford of the Royal Marines Light Infantry, HMS Victory. (Enlisted 3 December 1915.) Son of Ann and John Blackford; husband of Ethel Minnie Blackford (née Rumsam) of Stratford Road, Kensington;. brother of John (see above). Born in Ilfracombe 1 August 1879/ Died 19 June 1919 aged 39. Buried in Lynton churchyard. *Duncan Brownlie has supplied further information about this man on his transcription of the Lynton War Memorial. 66308 Sapper Charles Henry C Blackmore of the 150th Field Company. the Royal Engineers. Son of the late Frederick Blackmore and Alice Blackmore; Born in East Down in the March Quarter of 1896. Died 30 September 1918 aged 22. Believed to be 10/1746 Private Arthur Sydney Blake of the 1st Battalion, the Wellington Regiment, the New Zealand Expeditionary Force. Died 4 October 1917. Not yet confirmed but possibly this is Philip Arthur Blake, son of Arthur and Florence Blake of the High Street, Ilfracombe. 2nd Lieutenant Walter John Warrell Bowing of the 3rd Battalion, the Queen' (the Royal West Surrey ) Regiment, attached to the 6th Battalion. Son of John and Ann Warrell Bowring. Born in Fulham in the December Quarter of 1884. Died 30 July 1916 aged 31. Believed to be Sidney Stephen Mansfield Bridgeman, son of Sidney and Mary Bridgeman of Church Street who was born in Ilfracombe in the September Quarter of 1876. His military record is not yet confirmed. Captain Charles Edward Ridgway Bridson of the 3rd Battalion, attached to the 8th Battalion, the King's Own (Royal Lancaster Regiment). Son of Edward and Amy Ridgway Bridson of 5 St Margaret's Road, Oxford; brother of John (see below). Born in Chelmsford in the September Quarter of 1890. Died 4 April 1916 aged 25. 2nd Lieutenant John Paul Ridgway Bridson of the 8th Battalion, the Devonshire Regiment. Son of Edward and Amy Ridgway Bridson of 5 St Margaret's Road, Oxford; brother of Charles (see above). Born in Ormskirk in the December Quarter of 1896. Died 25 September 1915 aged 18. 74117 Gunner William James Burgess of the 15th Field Brigade, the Royal Horse and Royal Field Artillery. Son of Harry and Elizabeth Burgess of Chambercombe Road, Ilfracombe. Born in Ilfracombe 26 November 1895. Died 2 June 1916 aged 20. CH/498(S) Private William Ernest Cann of Chatham Battalion, the Royal Naval Division, the Royal Marines Light Infantry. Son of Lydia Ann Cann of Aysgarth, 6 Highfield Terrace, IIfracombe and the late William Cann. Born in Cardiff in the December Quarter of 1893. Died 20 June 1915 aged 21. 2nd Lieutenant Walter James Coe Carter of the 8th Battalion, the Devonshire Regiment. Son of James Coe and Maria Helen Carter of 30 Middlesex Road, Milton, Portsmouth. Born in Portsmouth in the March Quarter 1884. Died 14 July 1916 aged 32. M2/202425 Private Arthur James Challacombe of the 650th Motor Transport Company, the Army Service Corps. Son of William and Eliza Challacombe; husband of Margaret K. Challacombe of 6 Wilder Road, Ilfracombe. Born in Ilfracombe in the June Quarter of 1876. Died 16 March 1917 aged 40. Buried in Holy Trinity Churchyard. G/17134 Private George Lesie Challacombe of the 13th Battalion, the Royal Sussex Regiment. Son of Edgar George and Ellen Elizabeth Challacombe of 22 Belmont Road, Ilfracombe. Born in Ilfracombe in the September Quarter of 1898. Died 27 September 1917 aged 19. 2nd Lieutenant Reginald Charles Chapple of the 4th Battalion, the Duke of Cornwall's Light Infantry. Son of Charlie and Bessie (née Geen) of Rydal House, Shipston-on-Stour, Worcestershire. Born in Exeter in the March Quarter of 1883. Died 12 April 1918 aged 35. 4550 Private Samuel Alfred Chapple of the 4th (Reserve) Battalion, the Devonshire Regiment. Son of Mr and Mrs S. Chapple of Ilfracombe; husband of Florence Emily Chapple of 23 Fore Street, Teignmouth. Born in Ilfracombe in the December Quarter of 1890. Died 8 January 1917 aged 26. 1780 Private Philip Chugg of the 1st Battalion, the Devonshire Regiment. Son of Philip and Martha Chugg. Born in Combe Martin in 1894 but went to live in Bristol. Died 29 April 1915 aged 21. In the 1911 census, Reginald James Holmes Clarke (born in Ilfracombe in the September Quarter of 1900) is described as the adopted son of Eskith and Emily Williams of West Down, Ilfracombe. However, his military career is not yet confirmed. 20929 Private William Henry Cockram of the 9th Battalion, the Devonshire Regiment. Born in Oakford, Devon. Died 2 July 1916. 108005 Sapper Lewis George Comer of the 123rd Field Company, the Royal Engineers. Son of John and Martha Comer of 28 Westbourne Grove, Ilfracombe. Born in Ilfracombe in the March Quarter of 1894. 16821 Private William George Carpenter Conibeare of the 9th Battalion, the Devonshire Regiment. Son of George Edward and Marian Conibeare of St. Brannock's Road, Ilfracombe; brother of Edgar (see above). Born in Ilfracombe in 1894. Died 227 August 1916 aged 21. Able Seaman Ernest Cook of the Mercantile Marine, SS Londovery Castle. Son of William Thomas and Susan Cook of Vine Cottage, Lee, Ilfracombe; brother of William (see below). Born in Lee in the September Quarter of 1897. Died 27 June 1918 aged 21. 41066 Private William Heaman Cook (aka Cooke) of the 2nd/5th Battalion of the Hampshire Regiment; formerly 28419, the Worcestershire Regiment. Son of Thomas and Susan Cook; brother of Ernest (see above). Born in Lee, Ilfracombe in the March Quarter of 1896. Died 20 November 1917 aged 21. 329016 Bombardier Alfred J. Cooke of the 159th (Devons) Heavy Battery, the Royal Garrison Artillery. Son of John Hill and Ellen Cooke of Ashley Terrace, IIfracombe. Born in Ilfracombe in 1892. Died 6 February 1917 aged 25. 12823 Private Charles James Cooke of the 9th Battalion, the Devonshire Regiment. Son of George Henry and Sarah Jane Cooke of Crowcroft, Slade, Ilfracombe. Born in Cirencester in 1893. Died 5 October 1915 aged 22. Lieutenant Arthur Bruce Copner of the 8th Battalion, the Devonshire Regiment. Son of Margaret Helen Copner (née Blagg) and the late Arthur Lewis Copner of Ilfracombe. Born in Ilfracombe21 July 1892. Died 25 September 1915 aged 23. 221 Lance Corporal Charles Copp of the 1st/6th Battalion, the Devonshire Regiment, attached to the 2nd Battalion, the Dorsetshire Regiment. Son of Thomas and Edith Copp of Moortown, Ilfracombe. Born in Ilfracombe in the March Quarter of 1888. Died 12 December 1915 aged 28.